I am going to try my best not to complain about the weather. Winnipeg (known to some as WinterPeg) gets a bad rap – and this winter has been really nice. Until last week, when it turned bitterly cold. On Friday the temperature hovered at about -33 C and today it’s better, but still a bone-chilling -23. It’s during cold spells like this that I like to pull out the big soup pots and let a batch of soup simmer away, warming the house and then warming me. You’re going to need a big pot for this one. 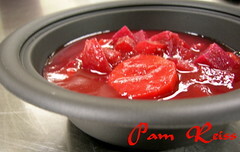 I use a heavy, enamel coated, cast iron pot – but any big stock pot that isn’t thin and flimsy will do. Rinse the ribs and bones. Place them in the pot. I must confess – my ribs weren’t completely thawed, so they went in whole. 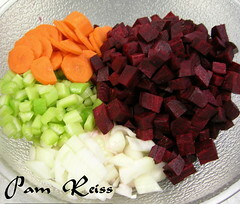 If you’d like to cut them up a bit to make them more manageable, you can do that now. 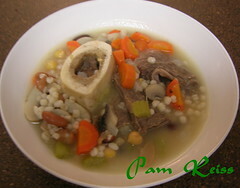 You could, of course, leave out the marrow bones if they aren’t your cup of tea – but marrow is a wonderful thing. 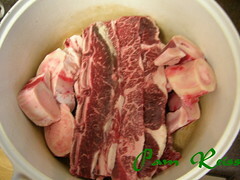 The bones will add more flavour and the marrow will add some richness. 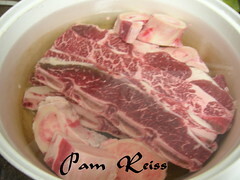 Pour the cold water over the bones and then the pot goes onto the stove (medium-high until it just starts to simmer). It won’t take long for scum to start coming to the top of the pot. Skim it. Skim it all – be vigilant. Stir things up every few minutes to release more scum – and reduce the temperature so that the water is just barely simmering. It will take a good 20-30 minutes for the scum to stop – keep skimming until the water is pretty clear (don’t worry about it being completely clear – just make sure that the scum has stopped forming, and remove whatever you can). You’ll find yourself with a bowl full of scum and foam to dispose of. Loosely cover the pot and let the meat simmer for 45 minutes. 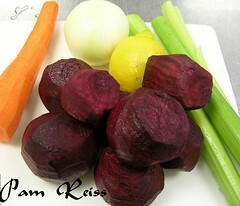 While the meat is simmering, prep your vegetables. I like everything chopped about the same size (small) – this is pretty forgiving soup though, so you decide how you like it. Rinse and drain the beans and barley. 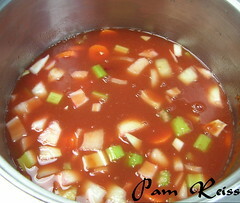 When 45 minutes are up, add all of the vegetables, beans and barley to the pot. Loosely covered and another 45 minutes of simmering. When I say ‘loosely covered’ I mean that it should be covered, but left open just a crack. I want some of the liquid to evaporate during cooking, but not too much. Make sense? 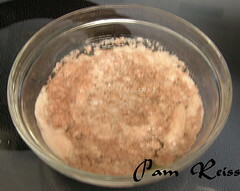 Add some salt and black pepper, taste, add more if necessary. Serve it up with some crusty bread. This does make a lot of soup – but on a cold winter weekend, it doesn’t seem to hang around. Should you find yourself with a lot of leftovers, it can be frozen and then reheated when another cold snap hits. Tonight dinner was a simple affair. I had a crazy morning at work yesterday – fighting the Christmas food shoppers to get some needed fruit and vegetables for work. As I pushed my way through the crowds and glimpsed the long line-ups at the cash registers, I decided that picking up some things for home would be a good idea. The thought of returning to the store after work was too stressful! I’ve had visions of wonton soup in my head for a few days now, so I bought some baby bok choy, Chinese broccoli, snap peas, mushrooms and green onions. The chicken stock, wonton wrappers and ground chicken I had at work – and everything else was at home. The wonton filling was a mix of ground chicken, finely chopped mushrooms and green onions, fresh ginger, soy sauce, toasted sesame oil and 1/2 of an egg white. 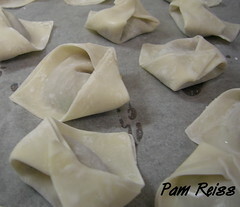 I let the wrappers thaw, brushed the edges with water – filled with some chicken filling and set aside. 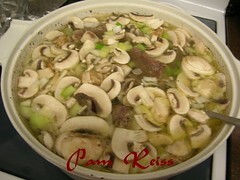 As the wonton assembly was under way, I was slowly bringing the chicken soup (diluted with water) to a simmer. 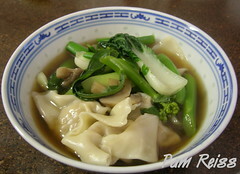 In went some quartered mushrooms – after a few minutes the wontons and then the Chinese broccoli went in. Simmer another minute or two and in goes the baby bok choy and the peas. Seasoned with soy sauce and it was ready to go. 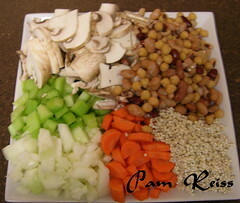 Easy to put together, and one of my favorite soups. The trick to making this not a good soup, but a great soup, is using really good homemade chicken broth. Tonight I used broth from work (made the same way I would make it at home) – but plans for this week is making a big batch of chicken soup at home. 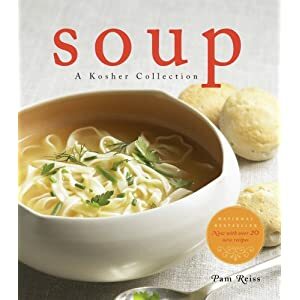 I’ll eat some of it as ‘classic Jewish chicken soup’ and hopefully have enough to stick in the freezer for the next time I’m craving the wontons.